When we first meet Maggie in the Pilot episode of Northern Exposure, Joel mistakes her for a prostitute when she is actually there to take him to his new home as his landlord. Why he makes this error in judgement is puzzling, but nevertheless, this first encounter sets the scene for the rest of their relationship: combative, featuring intense exchange of insults, along with an undercurrent of attraction. Maggie dresses in everyday clothes, pants, tucked-in t-shirt, a bomber jacket, signalling a no-nonsense quality in her character. Her wardrobe is definitely functional, as an Alaskan bush pilot who can fix toilets and install air conditioners. Yet she always has her shirt tucked in and her waist cinched by a belt, accentuating her small waist. She is a curious mix of masculine and feminine. There are elements gesturing to the era: 1980’s pleated pants, high-waisted, tapered jeans, as well as plaid shirts, and layers anticipating the grunge era. She essentially dresses in what men wear, but she is still very beautiful. It appears that she wears little makeup, but with such a stunning face, she doesn’t really have to. What is great about Maggie’s wardrobe (and the rest of the characters in general) is that they have a set of clothes that they wear over and over, just like in real life. We get pieces of clothing that appear over and over throughout the episodes, in different combinations. In the first season, we get hints that Maggie is more than her jeans, t-shirts, and insulated vests. In the Summer Festival and before a date with Rick she dons dresses and heels. Strangely enough, her dressing up outfits are rather unexpected: ankle-length dresses with flowery prints, nipped at the waist. It is not what I would imagine a tomboy would typically wear, but perhaps that is the point: to signal to viewers that Maggie has an unexpected soft side, that there is more to her than we think. But what makes the character of Maggie is her dark, short-cropped hair. We don’t want to say that Maggie = her hair, but it comes close. 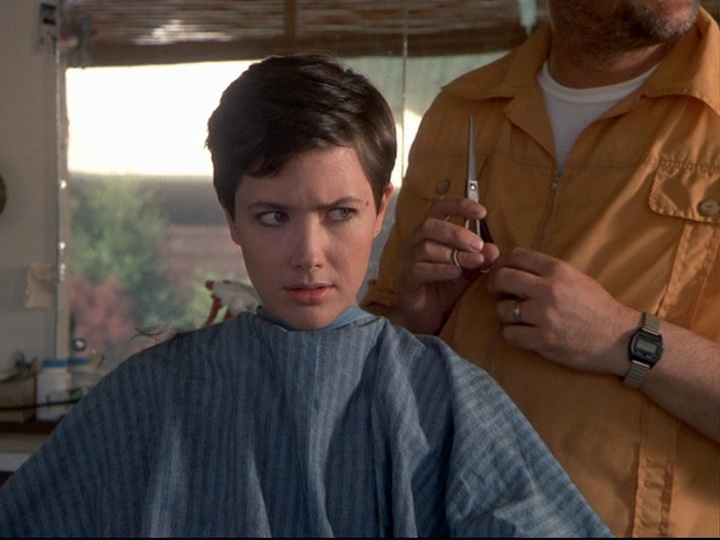 Her hair is cut boyishly, styled like a man’s hairdo in the 1950’s (we even see her getting a haircut at a barbershop in episode 1.6). It suits her practical, self-reliant character, but also sets off her face (with those perfect arched eyebrows!) perfectly. Not everyone can pull of such a cropped cut, but Maggie sure does. Thanks, glad you enjoyed it! We hope to do more NX style posts in the future, for sure!